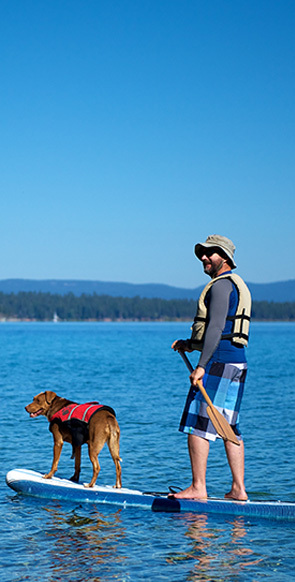 Glide across Lake Tahoe on a wooden sail boat or cruise on a powerful motorboat. Woodwind Cruises has sail boats leaving from both the Camp Richardson and the Zephyr Cove resorts up to five times a day. Motor boat cruises travel up both the west and east shores of Lake Tahoe. The cruise on the East Shore includes a visit to the Thunderbird Lodge Historic Site where a guided tour reveals the many eccentricities of the original owner. The West Shore cruise reveals the Hellman-Ehrman Mansion of Sugar Pine Point State Park and Emerald Bay with magnificent views of Eagle Falls, Vikingsholm Castle, and Fannette Island. Two stern-wheelers grace the lake. The M.S. Dixie II, home ported at the Zephyr Cove Marina, and the Tahoe Queen, home ported at the Ski Run Marina both offer a combination of nostalgia and crystal blue water adventure and both take visitors to Emerald Bay. Tahoe Gal is a modern vessel, christened in 1994, with the look and feel of a side wheeler. Home ported in Tahoe City, this vessel cruises the West Shoreline with its lavish real estate. A separate cruise visits Emerald Bay, passing the Erhman Mansion and Vikingsholm Castle. The Tahoe Paradise is a super modern luxury motor yacht launched in 1998 and incorporating the latest in nautical technology. The double-decker has a fully enclosed, climate controlled lower salon deck with huge picture windows for viewing the spectacular Sierra Nevada Mountains. The upper deck is open to the sun- or moon-shine and appropriate for lounging, weddings, or dancing. Other boating options include the Tahoe Cruz, a sailing yacht out of the Tahoe City Marina, and the Tahoe Princess, available for private charter, double hulled, accommodating up to 120 passengers, and home ported at the Ski Run Marina. For speed demons, the Tahoe Thunder is an 800 horsepower catamaran based at Timber Cove Marina.